Wellsteps: 20% of Boise’s teachers drink too much « They Said What? Yikes! Wellsteps just announced–and the Koop Award Committee just agreed–that 20% of Boise’s teachers have a drinking problem. Boise parents, before you start worrying, the good news is that it may not specifically be the teachers with the drinking problems. It’s technically 20% of all school employees, so you can relax. Maybe the problem is more prevalent in non-teaching employees, such as, oh, I don’t know, school bus drivers. Is Wellsteps right or wrong about the drinking problem in Boise? Read on and then you can decide for yourself. Having read their alcohol analysis ourselves, we’re doubling down on our original conclusion that Wellsteps deserves a Koop Award like Vladimir Putin deserves a Nobel Peace Prize. Wellsteps is way off base, meaning Boise’s schoolchildren are safe. Our original conclusion was reached simply by looking at the “smoking gun” slide in our previous posting, which they had tried to suppress (but we took a screenshot). We’ll expand on that slide another day. For now, just ignore that particular smoking gun and instead consider the rest of the smoking arsenal they just wrote up in their self-congratulatory press release. Speaking of smoking, today in addition to reviewing the Wellsteps analysis of Boise’s drinking, we’ll also include their smoking write-up. There was a saying in the old Soviet Union: “We pretend to work. They pretend to pay us.” For employees completing the Wellsteps’ Health Risk Assessment (HRA), the corollary would be: “We pretend to tell the truth. They pretend to believe us.” Of 3284 employees, 671 admitted to drinking. That means 80% of the Boise School District employees are teetotalers, as compared to 30% of the country as a whole. Or else — a shocker — 50% of the HRA respondents are lying. The Koop Committee did not question this result. Now let’s consider the 20% of respondents who admitted to drinking at all. How much do they claim to drink? A paltry 1.31 drinks a day, or about 10 ounces of alcohol a week. By contrast, the top 20% of drinkers in the US not employed by the Boise School District (“Boise”) consume roughly 43 ounces of alcohol a week. 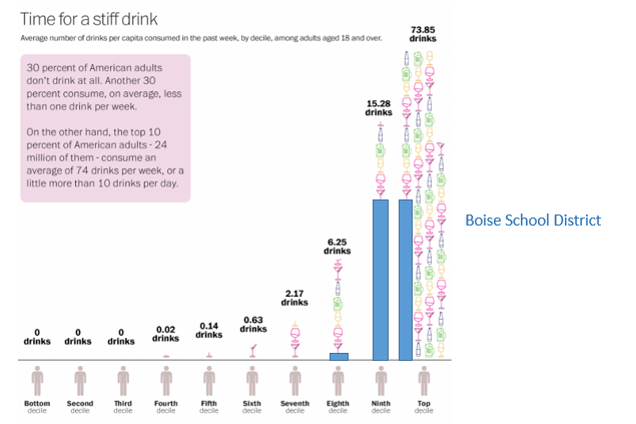 Let’s overlay the Boise School District consumption (in blue) against US consumption, on the following chart. It shows 10 ounces for Boise vs. 15 ounces for the second-to-top decile for the US as a whole, and vs. a whopping 73 ounces for the top decile. But wait. There’s even more. How much do you have to drink in order for Wellsteps to accuse you of having a drinking problem? Answer: any amount. According to Wellsteps, drinking alcohol at all counts as a “worst health behavior.” Shame on us for not realizing the evils of a glass of wine! 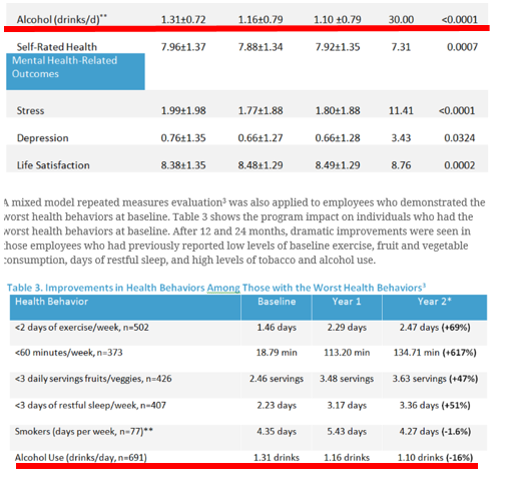 This screenshot from their writeup captures both the average respondent’s self-reported consumption of alcohol, at the very top, with the “worst health behaviors” in alcohol consumption at the very bottom. Note that the two rows of figures are identical. In other words, everyone who drinks has a “high level of…alcohol use” no matter how much they drink. The average consumption (meaning at least half are even lower) to count as a “worst behavior” and “high level of alcohol use” is the aforementioned 10 ounces a week. Squirrelly HRA findings aren’t confined to drinkers. Of the 3284 school district employees, apparently only 77 smoke (see chart above), placing the Boise School District’s alleged smoking rate at roughly 2.5%, or about 80% lower than the national or Idaho average. And those 2.5% are very light smokers. Whereas the average Idaho smoker burns through 16 cigarettes a day, Boise School District smokers abstain from smoking 10 days a month. So just like alcohol, hardly anyone smokes…and even the smoking employees hardly smoke. With this amazingly healthy population, it’s a wonder Wellsteps could make any improvements at all. But as we will see later this week, they made enough improvements to save massive sums of money, defying all odds and all rules of arithmetic, which are strictly enforced. By whynobodybelievesthenumbers in Uncategorized on July 27, 2016 . This made me laugh out loud. How could anyone deny that people lie on HRAs?? ?